In some ways, no two used bookstores are alike. Unlike new bookstores, every used bookstore carries an inventory that differs substantially from every other used bookstore. Differences in quantity, price and condition of inventory, not to mention methods of display, also differ considerably. However, if you've had much experience shopping in them, you've probably noticed that, despite their differences, they can be grouped into useful categories. Some have reasonable prices; some don't. Some have unusual inventory; some common. And so on. Most importantly, some stores thrive, and others don't. All businesses, of course, have life cycles, and many factors contribute to the duration and shape of individual cycles. Used bookstores are no exception. But the nature of the used bookstore business is such that many stores have predictably brief life cycles which conform to a distressingly familiar pattern. This pattern, in many respects, resembles that of a poorly maintained aquarium. When an aquarium is first set up, assuming the pH is balanced, chlorine is removed from the water, and a certain percentage of beneficial bacteria is allowed to develop, things usually go well. Fish are happy. 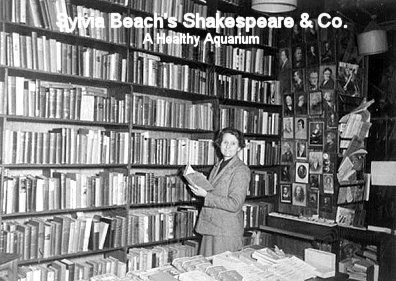 As time goes on, however, the continued success of the aquarium depends a great deal on how it's maintained. If replacing evaporated water with additional water is the only maintenance done, things begin to deteriorate. Why? Because toxins begin to develop from fish waste, excess food, etc. Toxins won't exit the tank through evaporation, and unless they are periodically removed, concentrations will increase and healthy fish will soon become sick. Removal can only be accomplished by both vacuuming the gravel and replacing at least 1/3 of the water in the tank monthly. A used bookstore can experience similar fates, depending on how it's maintained. If we equate, for the purposes of analogy, a store's inventory with the water in an aquarium, several parallels come to mind. Books "evaporate" off the shelves as they are sold, and if they are simply replaced with other books, the overall health of the store almost invariably declines. Why? Because the most desirable books are purchased first, and the undesirable, more "toxic" books are left on the shelves. Worse, as time goes on, books that don't sell become less and less desirable - that is, more toxic - for several reasons, among them the inevitable decline in condition as they are handled by customers and the gradual obsolescence of previously fresh content (though in some cases content may also hold or even appreciate in value). Here also is where the nature of the business sometimes factors in. In scale, most used bookstores are mom-and-pop-like operations. Employees are either few in numbers or altogether missing, and frequently it's all the owner can do to clerk, keep records, shelve new arrivals, and clean the store. Time available for acquiring new inventory equivalent or superior in quality to that being sold is short indeed, so short that many proprietors are forced to rely largely on walk-in customers to bring new inventory in for sale or trade. The problem with relying on this source is that it nearly always consists of a high percentage of junk, and yet if too much of it is turned away, shelves will empty. Gradually, over time, the inventory in a store that maintains itself with this method will devolve, becoming a repository for junk. This process can take varying amounts of time to occur, but a period of 5 to 10 years is not uncommon, with noticeable evidence of decline appearing well in advance of the end. Only stores which periodically flush a significant percentage of toxic books off their shelves and simultaneously exert a strong effort to acquire quality, pure-water inventory have a good chance of survival beyond the typical cycle length noted above. As in online bookselling, perhaps the single most telling factor for success in an open shop is how much time and effort can be devoted to acquiring inventory. So - what are the implications of this for the bookseller who is searching used bookstores for inventory? Your success in finding quality inventory will depend in part on your ability to evaluate not only the overall health of a given bookstore but also, if the shop seems to be devolving, the point at which it currently finds itself in its life cycle. Stores which are thriving may be visited and re-visited periodically with some success. Stores in apparent decline may repay several visits early in their life cycle (and may even be superior sources to healthy stores) but most likely will be a total waste of time later on. The following article discusses how to investigate used bookstores and make useful evaluations and also offers some advice on types of inventory to look for.